The voyage started from the ancient castle in Viborg. 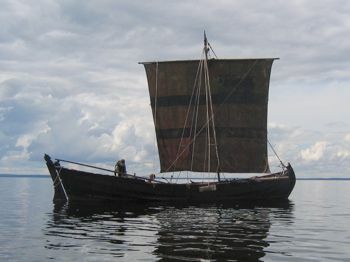 After Visotsk where all necessary papers were signed, Heimlosa Rus took course to Finland. Good favorable wind allowed to cover 40 sea-miles and next morning we came to Lapuri. In 1976 wrecks of a ship were found there and then they served as a model for the Heimlosa Rus. After 6 years of sailing around Europe the ship came back home. The captain's notes on the 2001 trip can be found from the project site. In addition, I have bunch of photos online. I was originally planning to participate in the 1998 trip across the mediterranean, but couldn't because of too much work. In 2001 I also had to leave the ship already in Loviisa because of the trip to the Pamplona bull run.